That's not our headline, but Bloomberg's, at the top of a blistering and important story about the OECD, the club of rich countries that has for decades been responsible for setting the rules and guidelines for the world's international tax system. "OECD officials “have been digging themselves deeper and deeper into a hole by blindly pursuing a mistaken approach that allows multinationals to avoid taxes,” said Sol Picciotto, an emeritus professor of law at Lancaster University in the U.K."
(Picciotto is a senior adviser to TJN, and author of a report on unitary taxation that we published a few weeks ago.) The story by the indefatigable Jesse Drucker looks at many things, but one of the most important is the close, even incestuous relationship between the OECD, a quasi-governmental body, and the industry that is making billions out of the broken international tax system, "whose basic structures were devised a century ago," Picciotto's report said. "The organization has long enjoyed a close relationship with industry. Its three top tax officials left in 2011 and 2012 to join firms that help companies avoid taxes by taking advantage of laws to move profits to locations such as Bermuda and Mauritius." "While its 34 member nations -- primarily the U.S., Japan and European countries -- underwrite the OECD’s $460 million annual budget, tax-planning firms that advise multinational companies have contributed hundreds of thousands of dollars to sponsor its conferences." "Although many experts do oppose unitary taxation, typically this is for reasons that do not withstand serious scrutiny, and which are largely due to vested interests in the present system. . . the complexity of the current system is highly lucrative for the large tax advice and tax avoidance industry including the Big Four accounting firms, and they naturally prefer to keep what they have." 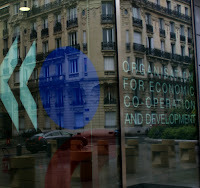 The Bloomberg article does note that the OECD has recently shown its first signs of willingness to consider serious, deep-rooted reforms, and although we welcomed the spirit of openness to fresh thought in the OECD's recent BEPS (Base Erosion and Profit Shifting) project, we are under no illusions that the vested interests fighting against serious change have multiple hooks into the OECD. And the Bloomberg story outlines one of those hooks. "Companies are pushing back. General Electric Co. (GE) has dispatched its top international tax official to lead an effort to change the OECD’s proposed guidelines on mailbox subsidiaries. In November, the OECD hosted public hearings in Paris, where one corporate tax representative after another objected to the plans." 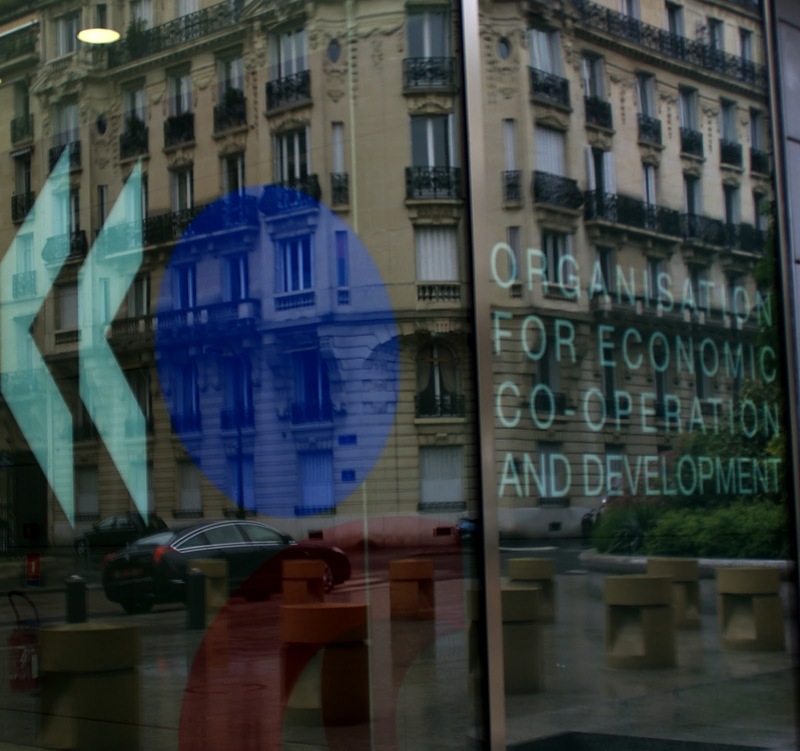 “Industry successfully leans on the OECD." "The Organisation for Economic Cooperation and Development (2000) created an initial list of tax havens. . . .The OECD excluded some low-tax jurisdictions thought by many to be tax havens, such as Ireland and Switzerland." The OECD later emphasised a black, white and gray list system for tax havens, focusing on their secrecy. Look at the latest version, from December 2012. The blacklist is entirely empty. And the gray list contains . . . the financial giant of Nauru, and nobody else. All the other tax havens are clean! On the positive side, street-level pressure in many OECD countries appears to be having results, and the possibility of real change now exists for the first time, not just with the OECD's BEPS project for corporate taxation, but also on secrecy, where the OECD has finally (after a lot of prodding) accepted that its next-to-useless system of 'on request' information exchange might not be quite so good as the far better alternative, automatic information exchange. But progress will only be sustained if the street-level protesters, journalists, non-governmental organisations and other representatives of ordinary taxpaying citizens keep holding their feet, and their indivial governments' feet, and the companies' feet, to the fire. Update: more on this from Richard Murphy, here.